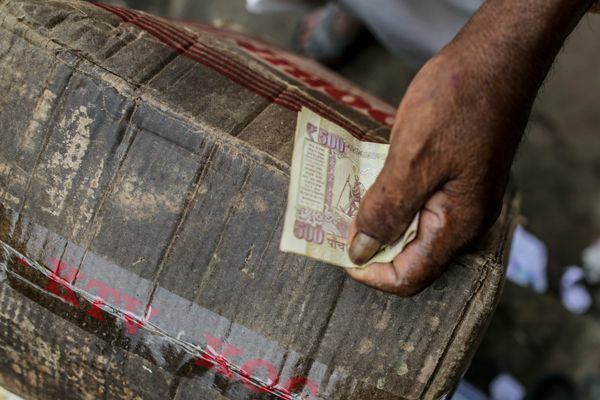 The rupee trimmed its initial losses, but was still down 10 paise at 64.90 per dollar in late-morning deals in the midst of sustained demand for the US currency from importers amid lower dollar overseas. The Indian rupee opened sharply lower at 64.95 as against yesterday's level of 64.80 at the Interbank Foreign Exchange (forex) market. It hovered in the range of 64.97 to 64.90 during the morning deals before quoting 64.90 at 1030 hours. "Fall in commodity and energy prices after yesterday's China GDP data has dampened sentiment a bit amid global growth concerns, a forex dealer said. "The USD/INR currency pair after failing to break 64.70 support on the back of strong central bank intervention is expected to break the 65 figure and move towards the 65.50 level, helped by risk-off sentiment," he further stated. The dollar index is currently trading down by 0.04 per cent at 94.88 as against a basket of six currencies. Overseas,the dollar gave back some of its overnight gains against the euro today after marking a 10-day high ahead of this week's European Central Bank meeting, which some investors believe could set the stage for additional stimulus later this year. Meanwhile, the benchmark BSE Sensex was trading higher by 38.33 points, or 0.14 per cent, at 27,403.25 at 1030 hours.